You can feel the strength and durability as soon as you walk in. 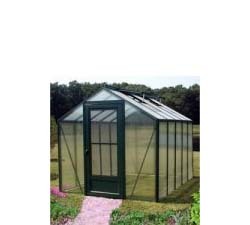 This roomy greenhouse is made from heavy gauge, extruded aluminum with a white baked enamel finish. It is covered with 8 mm clear polycarbonate which has a UV layer co-extruded onto the sheet. It provides an 82% soft diffused sunlight which results in lush, green plants. The covering allows high light transmission, tensile strength and flame retardancy. The greenhouse comes with gasketed bar caps to make assembly simple while providing strength for the structure. The greenhouse is made with nothing but the highest quality components.